It is obvious to say that tourists when visiting Vietnam must travel to Nha Trang to enjoy the beautiful beaches under the bright sunlight of the daytime and the delicious cuisine with mainly seafood at nighttime. 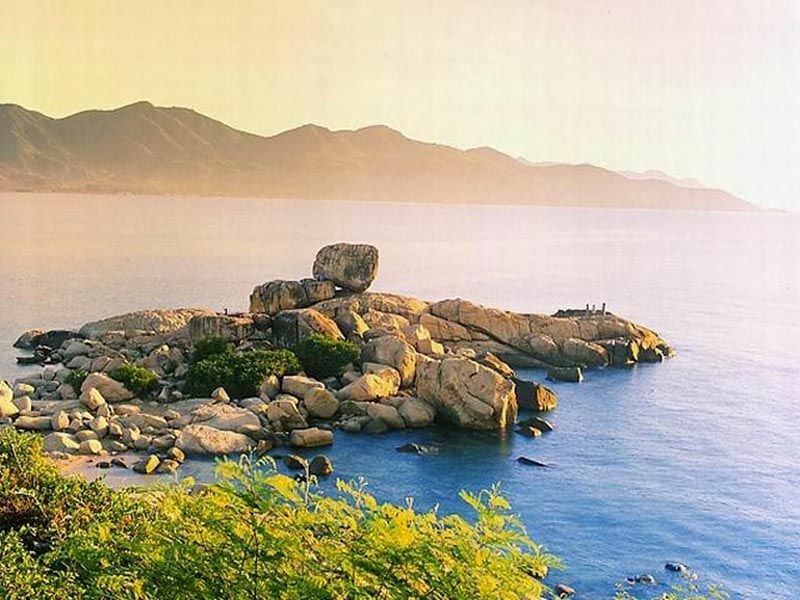 Besides beaches and food, Nha Trang is also famous for its natural landscape that has existed for a long time and attracted numerous people reaching. One of them, Hon Chong Promontory, is usually on the top list of tourists’ favorite destination. Located in La San Hill, Phuoc Vinh Ward, Hon Chong complex has included large rocks stacking each other for centuries. This is a large square rock block lying on a flat and huge rock. The side overlooking the sea houses vast hand-shaped indentations. According to the interpretation of scientists, it is the remains of the cavitation between the sea water and foothill. Unlike other beaches along Tran Phu Street in downtown, beach at Hon Chong area is fairly tranquil that reaching there, tourists can comfortably sit on the rocky promontory to fish out or move a few meters of the shore to bathe in smooth sands and gentle blue waters. In particular, multi-sized islands offshore surrounding whole area reduce the wind speed and impact of the typhoon. Beach on Nha Trang Bay and Hon Chong Promontory is thus considered one of the beautiful and safe bays, which are must-see tourist spots of Nha Trang travel. Hon Chong promontory consists of two enormous groups of rocks lying by the sea at the foot of La San Hill with rocks lying in disorder. 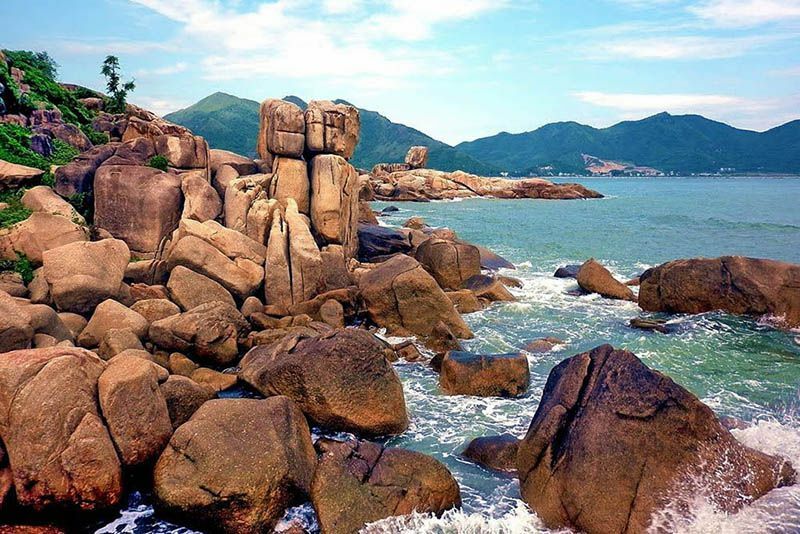 The grand group of rocks off-shore is called Hon Chong, the Chong Rock consisting a square-shaped block lying on a flatter and bigger one. You can see the neat imprints of a giant’s five-fingered hand engraved on the stone side facing the sea. According to a legend, once upon the time, when a giant man was sitting fishing there, a giant fish swallowed the bait and pulled him away. He tried to pull himself back with a fishing-rod in hand, pressing the other hand against the massive rock leaving the easily-seen imprints. On the rocky ground, several rocks stand strangely on one another such as two rocks standing upright with another big rock lying between like a big stone gate to another group of rocks. The second group of rocks bears the shape of a woman sitting facing the sea. It’s called Hon Vo, the Wife, that has a close meaning with Hon Chong, the Husband. 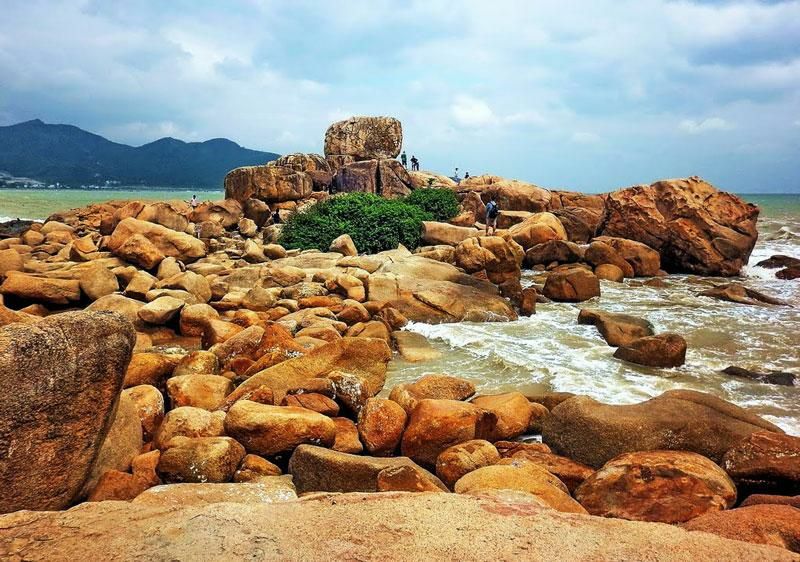 Being considered as one of the unique Nha Trang attractions, Hon Chong is a place to swim, to climb, and to experience the beautiful view of the beach and the land. Beach in Hon Chong Promontory has been recently explored for tourism development. In the past, tourists who would like to come here had to overcome steep hills and walk around. Tran Phu Street is now extended into La San Hill. Running along the coast towards the northeast from the city center, tourists will set foot on Hon Chong. Path to Hon Chong now is credibly dreamy thanks to a side of waters with golden sands endlessly stretching, and other side of the beautiful architectural works which is always busy passersby. Many tour operators have organized team games tied to rocks, hills and beaches here to create excitement for tourists. What’s more, Hon Chong Promontory is also rendezvous for nature lovers to admire the beautiful natural landscapes. Looking back the city, Hon Chong Promontory – La San Hill is one of the most beautiful coastal city’ showpieces with flexible curve of beaches along Tran Phu street and towering coconut ranges reaching out to catch the waves. Standing on Hon Chong, tourists can contemplate Hon Yen from afar, Cau Da Port on the right, Hon Tre Island and Nha Trang coast up to 6 km in sight. Hidding Lasan Hills is Nha Trang estuary and Cu Lao fishing landings. Viewing from Hon Chong is Co Tien Mountain in the other side. From Hon Chong Promontory, tourists will have a chance to clearly contemplate Hon Do (Red) (where houses a pagoda). 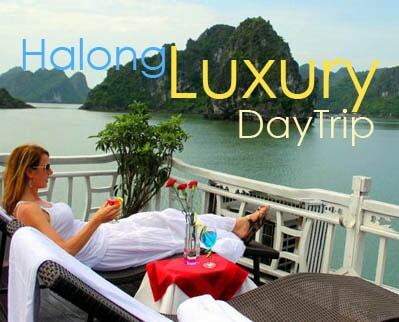 It is unique features that bring Hon Chong to become the indispensable highlight in Nha Trang city tour.